Digging a border within a lawn area serves several purposes. It can separate grassy areas from flower gardens, walkways and concrete driveways. Choose from a variety of edging materials once you have dug the border. Choices of edging range from plastic strips, wood, brick, stones, metal or leaving the border in a natural state with no edging. The hardest part of creating a border in a lawn area is the digging itself. Draw up a plan of the border including its location and size. 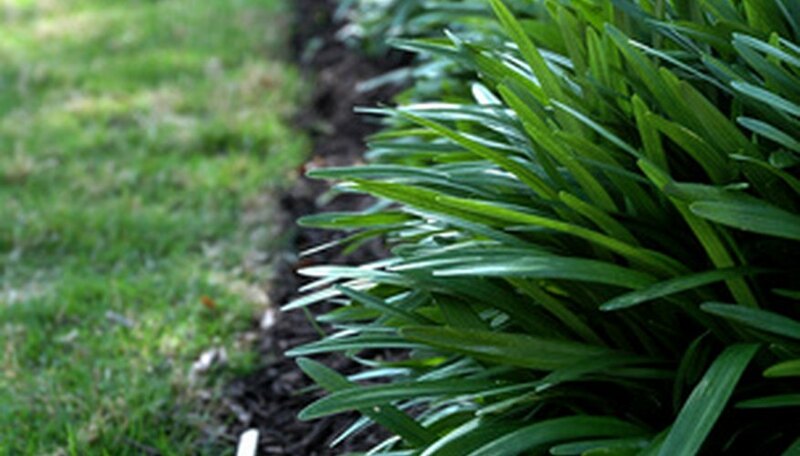 Consider any edging you are installing and the mature size of any plants you are using. This will give you an idea of how large you need to dig the border. Design straight or curved borders to flow naturally with the existing landscape. They're both as easy to dig, but give a different look to your lawn. Measure and mark the area where you will dig the border. Use spray paint to mark your cutting lines for the width and length of the border. This will help you keep the border equal on all sides. Use a non-selective herbicide and spray the grass you are removing. Turn off water to the area and saturate the grass with herbicide, being careful not to spray the product on lawn areas you wish to keep. Select an herbicide that will wash from the area and does not affect the soil in the long term. Allow the herbicide to sit on the grass for approximately three to seven days, until the grass turns brown and is dead. Dead grass is easier to dig up than live grass. If the grass shows signs of greening, repeat the process of applying herbicide and wait approximately three more days before starting the removal process. Cut through the outer edge of the grassy area you are removing, using a spade or shovel. Dig down deep enough to gather the grasses roots in your shovel. Digging out the grass in small squares will make the job easier and less cumbersome. Continue digging out the dead grass until you have all of it removed from the bordered area. Rake through the soil with a hard rake, removing any remaining grass strands or roots so you do not have regrowth of the unwanted grass. Rake the area level. Dig a trench that is wide enough to accommodate any edging you are installing.